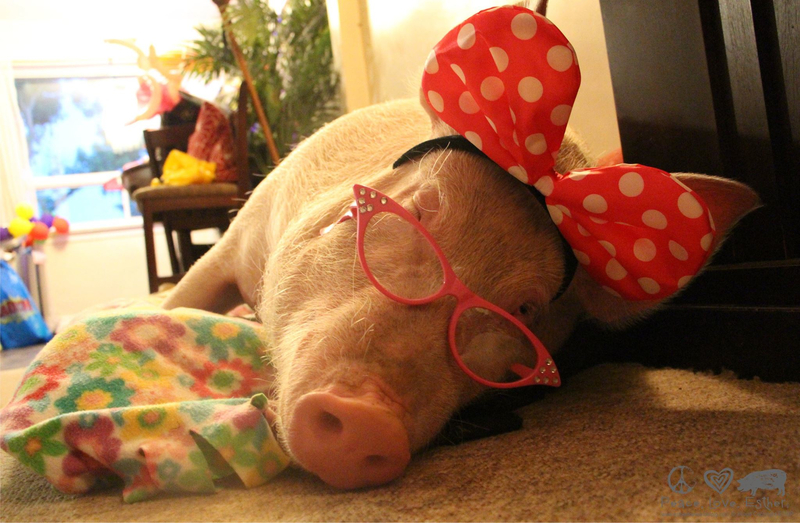 Have you heard of Esther the Wonder Pig? I hadn’t until Jo-Anne Guimond of Ottawa, Ontario nominated Esther and her “two dads” as Kickass Canadians. A quick visit to her website introduced me to a charming pig who stares right back at the camera, and who has a fan club and a kitchen and a store all her own. So what’s it all about? 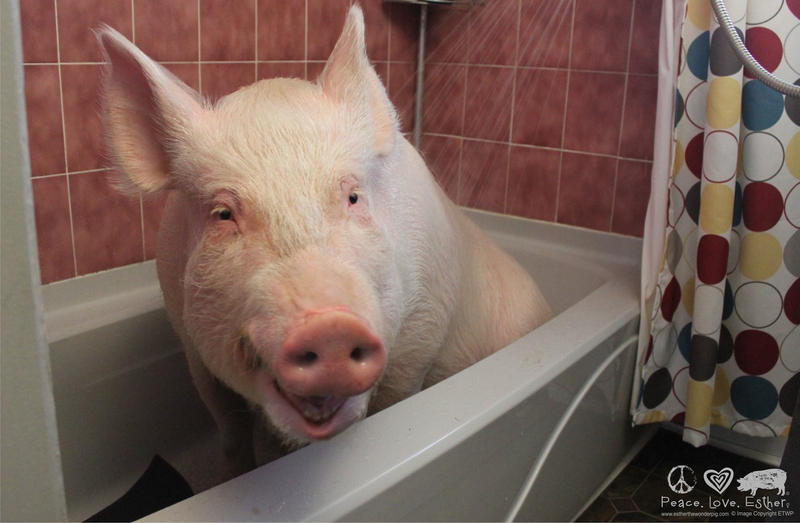 Funny thing is, Esther the mini-pig, who was promised to wind up weighing around 70lbs, grew and grew until she reached her current weight: 650lbs. No mini-pig at all, but rather a full-size commercial hog, Esther was destined to wind up on someone’s dinner plate, until Steve and Derek changed her fate, not to mention their own. By the time Steve and Derek realized there was very little about Esther that was, well, little—from her full-size personality to her giant appetite, not to mention her girth—it was too late; they’d fallen madly in love and couldn’t imagine parting with the pig. So they did what any new parents would do: they re-arranged their lives to accommodate her needs and build a supportive, nurturing environment (in their case, that included giving up meat and going vegan); potty-trained her; and of course created a Facebook page for their friends and family. But in keeping with the trend of everything-Esther being anything but ordinary, the page they created in December 2013 went on to become much more than a typical new parent’s Facebook page. It quickly amassed a huge fan following, proving to Steve and Derek that there was indeed an appetite for farm animals—one that was all about relating to them as living beings rather than as products for our consumption. 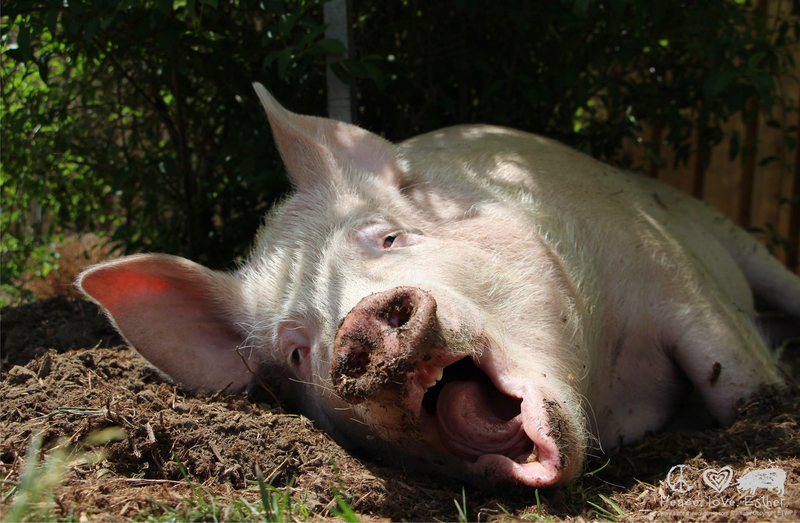 In the months that followed, the page, and the pig, evolved into a massive undertaking, involving a two-month Indiegogo campaign to raise funds for Happily Ever Esther – Farm Sanctuary, a safe haven in Campbellville, Ontario for abandoned farm animals in need of a home. All because of the mighty power of one “mini” pig. 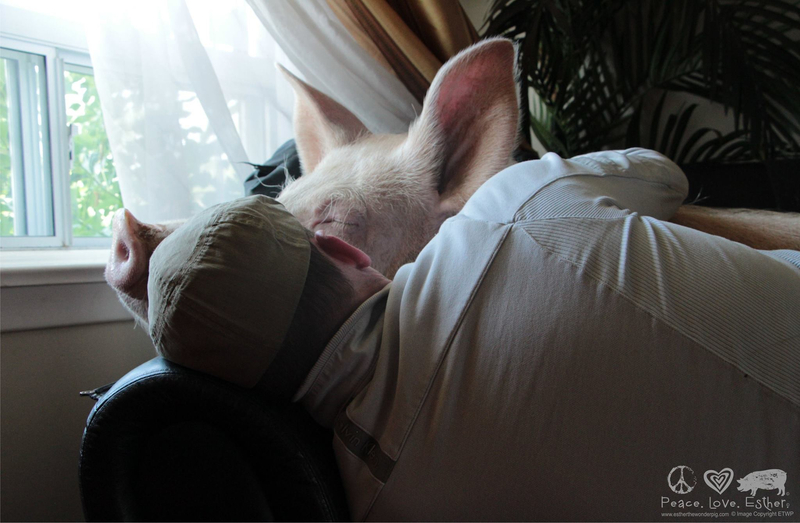 It seems hard to believe now, but Esther wasn’t always the focus of her dads’ lives. 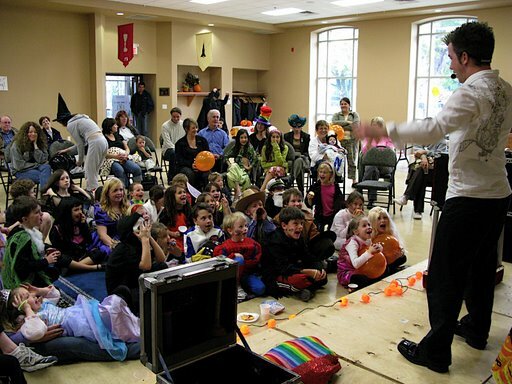 Growing up in Hagersville, Ontario, Derek showed an early interest in magic and started conducting his own magic shows when he was only 12. He trained through the co-op program at Hagersville Secondary School, earning credits to learn from magician Tim Hannaford. After graduating in 2001, Derek launched a successful one-man show that has enabled him to earn a living as professional magician. Derek was happy to master the trickery that goes on behind the curtains (where he says the real magic happens). But when Esther entered his world, he was no longer willing to indulge the trickery in his everyday life. That’s not to say Derek isn’t applying any lessons learned in the world of magic to his approach with Esther. In performing his one-man show at private parties, reunions, birthdays and holiday parties (in short, “a little bit of everything”), he realized it was better to keep his act focused on comedy. So with Esther, Derek and Steve are using that same logic. Instead of bombarding people with gory images of animals being slaughtered, or lectures about the benefits of giving up meat, they prefer to introduce people to Esther the Wonder Pig, letting them form their own connection with her. And in Esther’s Kitchen, instead of labeling food vegan, they call it Esther-approved (Esther herself being vegan) to avoid scaring people off. That savvy approach isn’t surprising, coming from two entrepreneurs who have run their own businesses for most of their working lives. (After Steve graduated from Georgetown District High School in 2001, he moved back to his hometown of Mississauga, Ontario and became a real estate agent.) But it’s not all about business strategy—far from it. Esther’s dads have been animal lovers since childhood. Derek grew up with cats and dogs as pets, and of course a rabbit because “it seemed like a magic show wasn’t complete without a rabbit,” he says. His family has a long history of hunting, but he always knew he didn’t have it in him to shoot an animal. The pair met in Mississauga in 2001, when both were working at Montana’s Cookhouse Restaurant—Steve as a bartender/waiter, Derek as a magician. They quickly became a couple, bonding in part over their shared love of animals. (To this day, Esther shares the house with two dogs, two cats, three rabbits and “a handful of minnows.”) But since bringing Esther home, their animal love has grown into a deeper respect for the role animals have in their lives, and how they want to treat all living creatures. 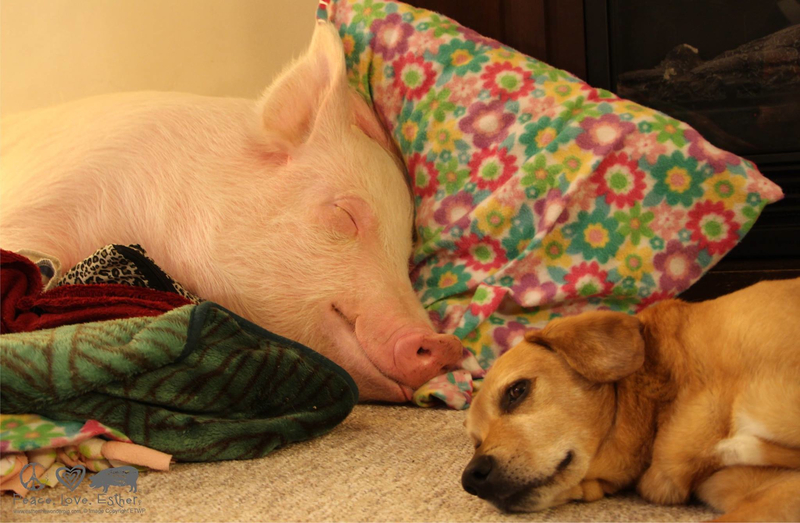 Once the duo definitively decided to keep their “mini” pig, and replaced Derek’s nickname for her (Kijiji) with a “comfortable, old-fashioned” name that seemed to suit Esther, they launched into a “nightmarish” eight months. 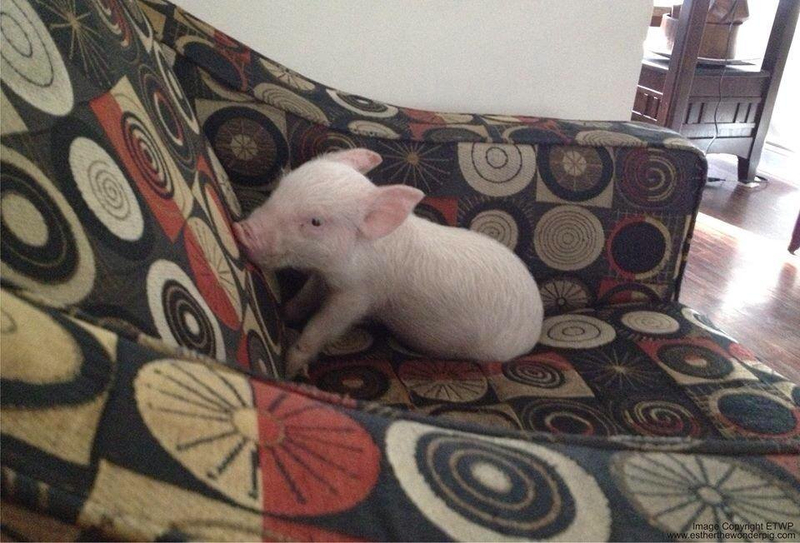 To start with, about a month after they brought her home, a vet “rang the alarms” that Esther might not truly be a mini-pig. Her dads kept up that hope until she was about 250lbs. Finally, they realized it was time to ditch the plan to train her to use a giant dog crate as a litter box and start re-training her to do her business outside. It was a long haul. But in spite of the many hassles, Esther stole her dads’ hearts, forcing them to re-evaluate how they lived their lives and reconsider what really matters. “But I don’t think you know you have that burden until you decide to do this,” says Steve. “That’s exactly it,” says Derek. When Esther comes up, in print and in conversation with her dads, there’s a lot of talk about her intelligence. Steve and Derek marvel at her ability to open cupboards and remember their contents. Or how she mastered those peanut butter-filled treat balls, even when her dog brothers, Shelby and Reuben, couldn’t keep up. For all Derek’s magic training, they never had to teach Esther any tricks. Even learning to sit on command came about almost accidentally. When Steve discovered that Esther would fall back on her behind if she reached too high, he pounced on the opportunity; he told her repeatedly to “sit” and then gave her a treat. After only one try, she was able to repeat the action on command, much to her other proud poppa’s surprise and delight. “It was just unbelievable how quickly she picked stuff up,” says Steve. They also talk lovingly about how hilarious, affectionate and endlessly curious Esther is. “Anything that comes into the house that’s out of place, or if she’s been outside and she comes in and there’s something in the house that wasn’t there before, she’s gotta go explore it and figure out what it is,” says Steve. With so much emphasis on Esther’s intelligence and disposition, it begs the question: Does it matter? Aren’t all animals worth respecting and protecting, regardless of their IQ or friendliness? 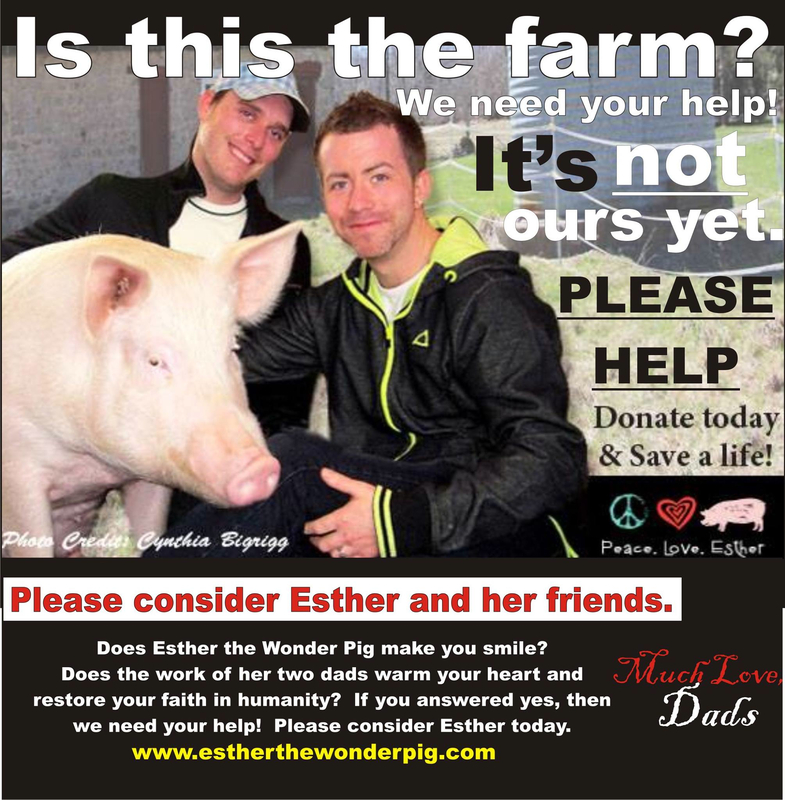 The Esther Effect should kick into high gear once her sanctuary opens. In the coming months, Steve and Derek (and their animal children) will move in and start inviting volunteers to sign up for work days at Happily Ever Esther. 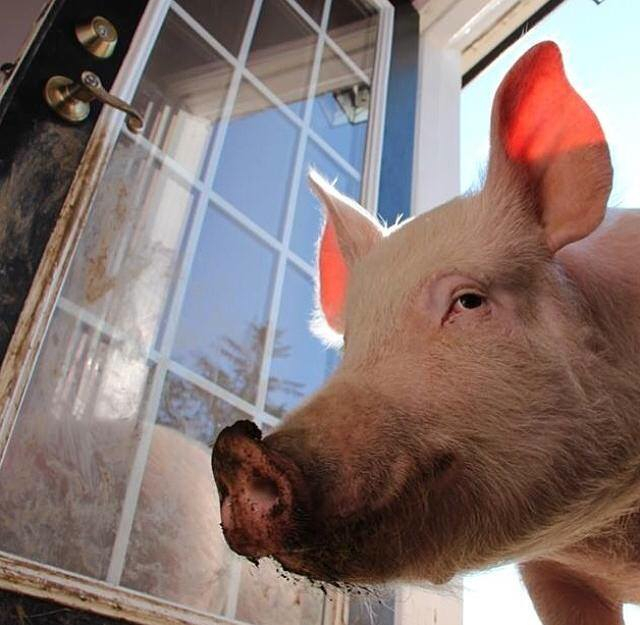 Their hope is to open the sanctuary to the public on Esther’s third birthday—Canada Day 2015, a fitting birthday for such a Kickass Canadian. The idea for the sanctuary didn’t come about solely because of Esther. Her dads always planned to have a retirement property (“our own sanctuary”) where they could rescue animals. It’s just that they envisioned it as more of a hobby farm than a public enterprise. But because of the platform Esther has provided—the Esther Effect—things have taken an unpredictable turn for the better. As significant as their financial contribution is, Steve and Derek’s commitment to Happily Ever Esther is about more than just covering the costs. Steve will keep up his real estate work, but Derek’s magic has taken a back seat, and will continue to, given that it’s mostly weekend work (although they plan to find a way to incorporate his magic into the sanctuary). Esther’s dads field thousands of comments a day, from the Facebook page alone. The store, which sells Esther-inspired shirts, bumper stickers and jewellery, brings in enough money for them to pay a full-time Executive Assistant. But one thing they will never hand over the reins on is replying personally to every message, and selecting the photos and captions. Surprised or not, they have the best of intentions and the highest of hopes for the sanctuary. First and foremost, they want it to provide a place for people to make the same connection with animals that they did, so that it will lead them to start exploring alternatives and looking at other ways to be more sustainable and healthier. That’s the thinking behind becoming a registered charity, a process they’ve already initiated, and charging a suggested donation for every visit to the sanctuary. It’s also why they’re planning the Community Garden, both to show people how easy it is to grow their own produce at home, and to sell their fruit and veggies in the farm market. With plans well underway for Happily Ever Esther, I can’t help but wonder how Esther herself is reacting to all of this. So I ask: What do you think Esther would say if she could talk? 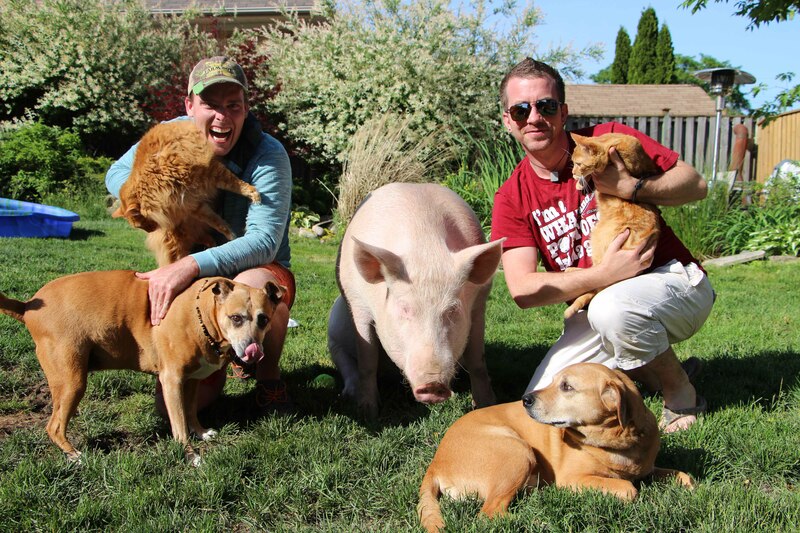 For the latest on Esther and her dads, visit estherthewonderpig.com, ‘Like’ her Facebook page, join Esther’s Army, follow @EstherThePig on Twitter and check out her YouTube channel. You can also help support the sanctuary by making a donation. To adopt a farm animal of your own, please Google your local sanctuaries and find out how you can get involved. Thank you to Jo-Anne Guimond for nominating this wondrous trio, and to Esther the Wonder Pig’s Executive Assistant, Gilda Berlingieri, for making this interview possible. They are all AWESOME Kickass Canadians!!! Great article. Esther has changed not only Steve and Derek’s lives, but in varying ways the lives of many of us in Esther’s extended worldwide family. I see Esther in every package of meat at the supermarket, and her face in every news story or advertisement about bacon or other forms of meat. And it’s true, we have ignored it for too long, but we’re finally waking up. Thank you for reading it, Cindy – glad you enjoyed it. And that you’re feeling the Esther Effect! What a great article on this amazing family! I have certainly been taken in by the Esther Effect… and I’m OK with that. 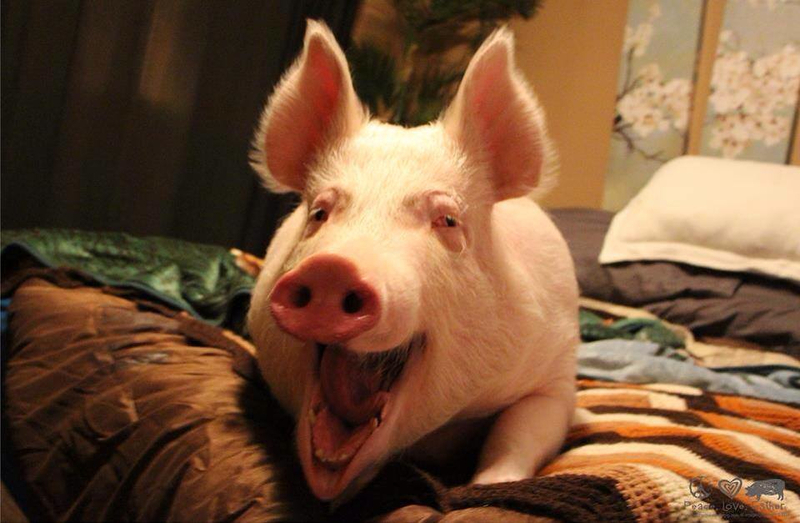 Jo-Anne, you’re the reason the Esther Effect has spread here – pretty kickass of you!! Truly an amazing story that was always meant to be! Esther is loved globally and is an inspiration to anyone desiring to contribute to making the world a better place. ESTHER = COMPASSION, LOVE, PEACE, CARING…the list goes on!! Thank you for writing this story (I learned some more about Steve and Derek) – I am so in love with Esther (and her family). Although I was a vegan before, Esther just confirms my belief that animals are not ours to eat or abuse, and regardless of their size or breed, they deserve our love and respect. Thank you for the comprehensive and beautifully written story about Esther The Wonder Pig and her dads. We too have fallen under the Esther Effect, happily giving up pork products and slowly moving towards vegetarian living. I am one of the thousands of fans committed to Esther’s family and the dream they are living; I am a tiny player in the wings trying to help them succeed in any large or small way I can. This amazing journey, which grew out of love and is based on kindness and education, is such a novel approach. No one is forced to defend themselves in this profound discussion, which is ultimately about ethics, the environment and feeding the world. I love the metaphor to the Wizard Of Oz curtain – that is precisely how I awoke years ago when a journalist exposed factory farming on an NPR expose I listened to. I literally felt like I’d been punched in the stomach… I was utterly uninformed until that moment. Kind hearts are yet to be awakened. Esther’s talent for snapshotting herself with just the right comment will hopefully draw the curtain wide open, allowing minds to see clearly what exists in the shadows. 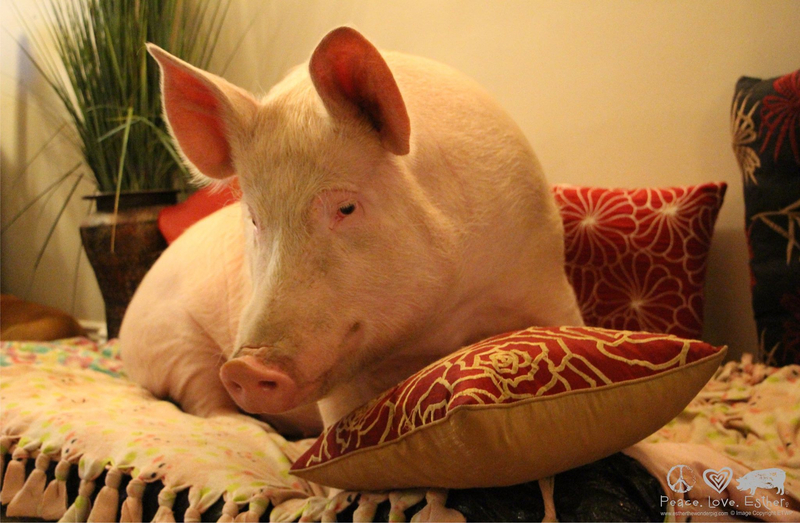 Did you ever think that your Esther could be a “guard pig”? I ask because my husband as a teen in the early sixties had an older friend (born on a farm) who brought one of the farm pigs to Toronto to live with him. Now, his friend wasn’t exactly a stellar citizen, drank & slept quite alot. My husband said when he went to visit him, the pig would come running to the door, not exactly Freddie Kruger style but scarey. My husband figured by the time a thief saw the pig, he wouldn’t have any interest in finding the piggy bank. True story! What a great article! I have followed Esther on Facebook for some time and I also follow her website. I love Esther and I think her dads are pretty much the greatest things since sliced bread. I contributed to Esther’s Sanctuary and I firmly plan to visit it next year. In fact, I can’t wait! I truly think that what Derek and Steve are doing is just fantastic. Thank you, Carol – and to all of you who commented. So glad you enjoyed the piece. I just wrote to Steve the other day, marveling at how wonderful and also inventive their initiative is. On top of providing a safe haven for farm animals, he and Derek are finding creative ways of making an animal-friendly lifestyle more accessible to people who might otherwise be intimidated. Inspiring! What an absolutely inspiring story this is. 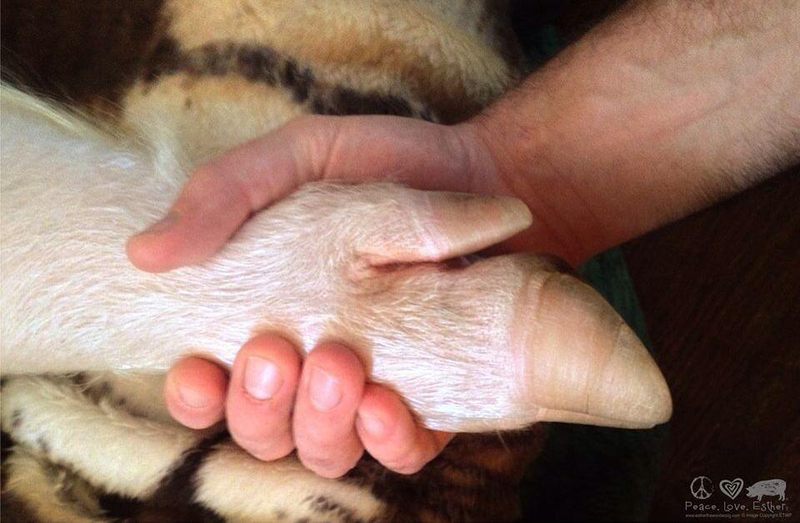 Steve and Derek are true animal lovers and activists. Their example should be spread world-wide so that people know that the phrase “they’re just animals” is a load of bunk! Carry on the wonderful work you’re doing guys – I would love to meet Esther some day! Glad you found the article, Jan! If you’re ever near TO, you CAN meet Esther at her sanctuary once it opens to the public on her birthday in 2015 – July 1 (Canada Day!). Best article ever about Esther and her dads! I’m using this for when I want anyone to know the whole Esther story. Thanks!! I think it is absolutely fantastic what you, Steve and Derek, do and I hope it will reach many many people in this world. Since you are already doing so much I am almost ashamed to suggest to you to engage yourselves also in the barbarian seal slaughtering that takes place every year in Canada. But since you have so much empathy for animals I thought this might hurt you as much as it hurts me. Anyway, you have my greatest admiration for what you are doing!!!! Excellent article! Thank you so much for sharing so much of Steve and Derek and their plans. I’m so excited for them! Esther made me go vegan, too. For SURE Kickass Canadian!! I have followed Esther from the very beginning, when I watched a video of Steve and Derek professing an unconditional love for a pig they picked up, thinking she would forever remain tiny… Yet what a surprise they got, with a very large, beautiful, full-on pig with a sweet and funny personality, a huge appetite and a gorgeous smile, with a set of soulful eyes… Yep, that’s the Esther we all know and love today… What I wouldn’t give to be able to change the world’s view of farm animals, through the eyes of one sweet loving pig named Esther… I believe she is the reason for thousands who are now living a vegan lifestyle. Peace, Love and Esther!!!! This is most inspiring story I have read in a very long time. 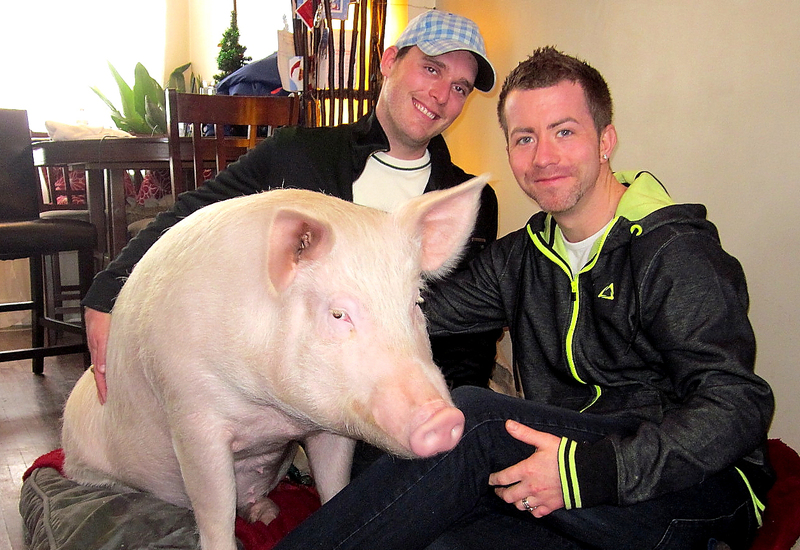 Steve and Derek are absolutely brilliant for making Esther such a marvelous ambassador. Thank you to my niece Dawn for first sharing Esther’s story with me. 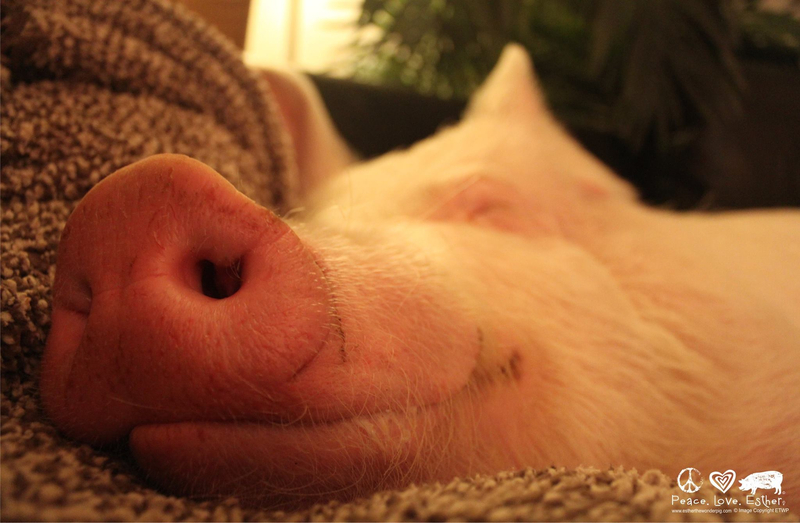 I hope one day to be able to visit Esther and the miracle farm sanctuary. My mother’s family was all from Canada and I feel almost a dual citizenship with our friends north of the border. Great job guys, keep it up. Thanks for writing, Penny! I’m so glad you found their story here. Amanda, I’ve been following Esther since before they moved to the Sanctuary and I want to commend you on writing a thoughtful and compelling article about her. Blessings. Nancy, thank you for saying so! Really happy you liked the piece. Esther offers great inspiration. Beautiful comment, Debbie – thanks! LOVE LOVE LOVE… just oozes from this wonderful story! Steve and Derek are my heroes!! I have always wanted to start a sanctuary… They inspire me 🙂 I look forward to visiting the farm soon and promoting Esther’s Cruise when our site goes live next week!! Blessings to you all! Andrea, thanks for helping make Esther’s Cruise happen! Esther is a fun animal, I have seen several of her videos on YouTube.